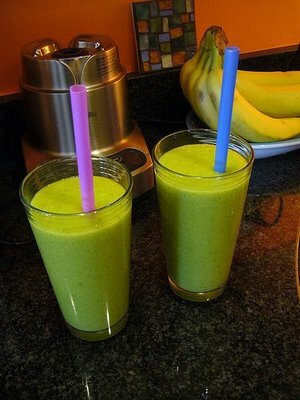 I had gotten these green smoothie recipes a few months ago, and after trying one of them I have fallen in love. Jill had posted on facebook that she needed a way to get one of the kids their veggies. I have been telling Matt for awhile that since this tastes like a banana shake, it would be an easy way to act like it is a Hulk smoothie or something and get spinach into a kids diet. then add 1-2 cups of ice depending on how icy you want it and blend it again. * If your banana is not ripe enough or if you want it sweeter add a little honey (I use local to help my allergies) and it is perfect. It only takes 2 minutes to make. Easy and so good. 1 large leaf of kale (optional) Kale is full of good stuff but does make the smoothie not taste quite as good. I would recommend adding this later. First just start with the other ingredients and get that down. You can play with the amounts as desired but that is what works for me. It doesn't have to be exact. It's such a great way to start your day. I often cut up everything the night before and put it in the blender and put it in the fridge overnight without blending it. Then in the morning I just add the almond milk and blend it. That way I don't run out of time in the morning to get my day started right.